Do you dream of living abroad? If so, you’re in good company. Tens of thousands of people every year leave Britain to start life as an expat – leaving behind the security of work, family and friends for the promise of better weather (hopefully), better prospects (sometimes) and a carefree existence (keep dreaming). So is now the time to move abroad? Or have you already started planning the big move overseas? 101 Reasons to Live Abroad … & 100 Reasons Not To helps you discover if living abroad is right for you. It’s an uplifting guide to the positive sides of life as an expatriate – and a reality check about the challenges that relocation brings. The book is divided into 10 chapters, covering 10 all-important areas of overseas life – from the vagaries of the weather to the emotional ups and downs of leaving family and friends. There are sections on bureaucracy, work abroad and making ends meet – but also about more everyday concerns such as culture, home life and (of course) food and drink. The last chapter asks if you’re ready for the big change of identity that living overseas brings – and offers a final, 101st reason to live abroad for those who are still wavering. So buy 101 Reasons to Live Abroad … & 100 Reasons Not To – and start thinking seriously about your move abroad, today. “Decent, civil folk, who had been brought here … by a perfectly honourable passion for sunlight and low income tax.” Such is Lawrence Durrell’s description, in his classic 1950s travelogue Bitter Lemons, of British expats in Cyprus. The British passion for sunshine is undimmed, and by and large we’re as decent and as civil, but in this climate of austerity there is less sympathy available, it seems, for those expat Brits who retire to Cyprus and enjoy the current version of those low rates of taxation (5% for pensioners, if you are prepared to sacrifice certain personal allowances). Retire abroad in search of low taxes, so the popular argument runs, and don’t be surprised if you suffer financial uncertainty as a result. The argument is superficially attractive, but it’s the premise I would challenge. 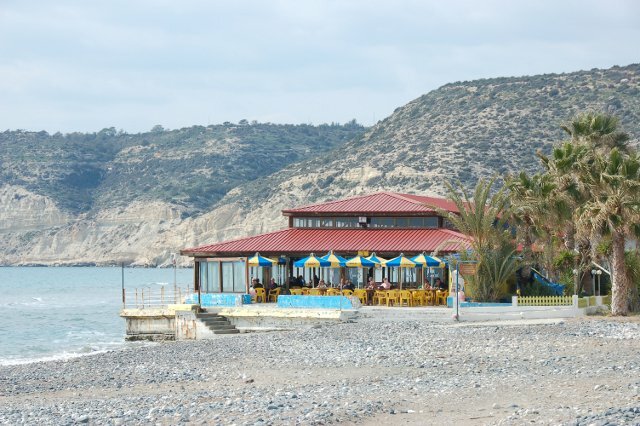 Who really retires to Cyprus to avoid tax? Or do people decide to live in Cyprus – and countries like it – because of something more important: sunshine, yes, but also the chance to travel, quality of life, low crime, and even perhaps a nice sea view into the bargain? I can’t, of course, be unbiased on this subject. I’m half-Cypriot and I love Cyprus, and it upsets me to see the country suffering as it has in recent weeks. But because I’ve lived in Cyprus and grown to know British retirees there, I understand that many live in Cyprus because they fell in love with the place – 10, 20, 30 years ago, when the island was far less developed than it is today – and nurtured a dream to come back. In these circumstances it takes a lot to make you fall out of love – so I don’t doubt that most Brits who’ve thrown their lot in with Cyprus, especially the ones who went there for the right reasons, will stay. That’s not to do down the serious trouble that Cyprus is in. The Europe-wide outrage caused by the first, botched bailout – in which even the smallest depositors stood to lose 6.75% of their money in Cypriot accounts at a stroke – remains the culprit here, as it was the spark to the tinderbox: the single incident that suddenly made the Cyprus crisis synonymous with Europe’s crisis. It was that error that led the world’s journalists descending on Cyprus en masse – and the resulting, steep, sharp loss of confidence will take time to recover from. Expats and Cypriots alike – now mostly breathing a sigh of relief that they won’t be subject to a levy on deposits below €100,000 – could hardly be blamed for complaining to those journalists about the injustice of a tax on insured deposits, and it seems to me that the revised bailout, while uncomfortable for many, is fairer for most. Moving abroad is a personal decision, and when you leave Britain these are the kinds of things you may think seriously about: a country’s stability, its financial security, the cost of moving your money around, the likelihood of currency swings, whether you’ll miss family and friends, what side of the road you drive on, whether you get on with the food, whether you can make ends meet, whether you can get internet, your attitude to bureaucracy, and a hundred other things that may be more or less important to you. As expats everywhere will testify, there’s more to the decision than the rate of income tax. And if you’re thinking of living in Cyprus: read Bitter Lemons. That will give you a sense of how far – or otherwise – we’ve all come. Expat website ExpatArrivals.com has published a glowing review of Islebright’s 2013 expat guide, 101 Reasons to Live Abroad … & 100 Reasons Not To. It’s true: although the book is primarily aimed at British expats, many lessons from expat life are universal. Some Brits abroad may miss bangers and mash, but the lure of home comforts is something we can all relate to. Many Brits may be desperate to leave behind the grey wintry weather, but if you live in a hot country, you are just as likely to get sick of sweltering summers and the hum of the air conditioning unit in the corner. Life has its upsides and downsides everywhere – and if we can ask ourselves why we’re living where we are or why we dream of moving abroad, we’re more likely to find the right place to live. Each year, tens of thousands of Brits move abroad, in search of better prospects or a new perspective on life – but expat living is not for everyone. 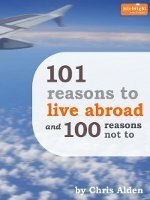 My new book, 101 Reasons to Live Abroad … & 100 Reasons Not To, is a guide to the ups and downs of living overseas – so you can work out if the big move abroad is for you. The book is based on the lessons I learned while living as a British expat in Cyprus for three years – but the universal lessons, from coping without old friends to craving a decent jalfrezi to keeping an eye on international money, can be applied to practically anybody in any country in the world.